For the list of individual islands belonging to the state of Hawaii, see List of islands of Hawaii. The Hawaiian Islands ( Hawaiian: Mokupuni o Hawai‘i) are an archipelago of eight major islands, several atolls, numerous smaller islets, and seamounts in the North Pacific Ocean, extending some 1,500 miles (2,400 kilometers) from the island of Hawaiʻi in the south to northernmost Kure Atoll. Formerly the group was known to Europeans and Americans as the Sandwich Islands, a name chosen by James Cook in honor of the then First Lord of the Admiralty John Montagu, 4th Earl of Sandwich. The contemporary name is derived from the name of the largest island, Hawaii Island. The U.S. state of Hawaii now occupies the archipelago almost in its entirety (including the uninhabited Northwestern Hawaiian Islands), with the sole exception of Midway Island, which instead separately belongs to the United States as one of its unincorporated territories within the United States Minor Outlying Islands. 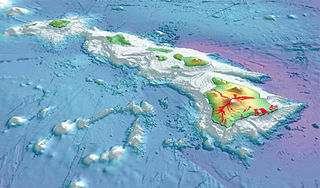 3-D perspective view of the southeastern Hawaiian Islands, with the white summits of Mauna Loa (4,170 m or 13,680 ft high) and Mauna Kea (4,206 m or 13,799 ft high). The islands are the tops of massive volcanoes, the bulk of which lie below the sea surface. Ocean depths are colored from violet (5,750 m or 18,860 ft deep northeast of Maui) and indigo to light gray (shallowest). Historical lava flows are shown in red, erupting from the summits and rift zones of Mauna Loa, Kilauea, and Hualalai volcanoes on Hawaiʻi. 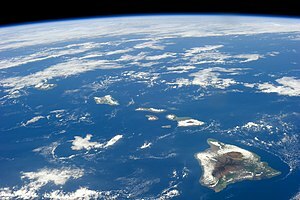 A composite satellite image from NASA of the Hawaiian Islands taken from outer space. Click on the image for a larger view that shows the main islands and the extended archipelago. This chain of islands, or archipelago, developed as the Pacific Plate moved slowly northwestward over a hotspot in the Earth's mantle at a rate of approximately 32 miles (51 km) per million years. Thus, the southeast island is volcanically active, whereas the islands on the northwest end of the archipelago are older and typically smaller, due to longer exposure to erosion. The age of the archipelago has been estimated using potassium-argon dating methods. From this study and others,   it is estimated that the northwesternmost island, Kure Atoll, is the oldest at approximately 28 million years (Ma); while the southeasternmost island, Hawaiʻi, is approximately 0.4 Ma (400,000 years). The only active volcanism in the last 200 years has been on the southeastern island, Hawaiʻi, and on the submerged but growing volcano to the extreme southeast, Loʻihi. The Hawaiian Volcano Observatory of the USGS documents recent volcanic activity and provides images and interpretations of the volcanism. Kīlauea has been erupting nearly continuously since 1983. Almost all of the magma of the hotspot has the composition of basalt, and so the Hawaiian volcanoes are composed almost entirely of this igneous rock. There is very little coarser-grained gabbro and diabase. Nephelinite is exposed on the islands but is extremely rare. The majority of eruptions in Hawaiʻi are Hawaiian-type eruptions because basaltic magma is relatively fluid compared with magmas typically involved in more explosive eruptions, such as the andesitic magmas that produce some of the spectacular and dangerous eruptions around the margins of the Pacific basin. Hawaiʻi island (the Big Island) is the biggest and youngest island in the chain, built from five volcanoes. Mauna Loa, taking up over half of the Big Island, is the largest shield volcano on the Earth. The measurement from sea level to summit is more than 2.5 miles (4 km), from sea level to sea floor about 3.1 miles (5 km). .
On October 15, 2006, there was an earthquake with a magnitude of 6.7 off the northwest coast of the island of Hawaii, near the Kona area of the big island. The initial earthquake was followed approximately five minutes later by a magnitude 5.7 aftershock. Minor-to-moderate damage was reported on most of the Big Island. Several major roadways became impassable from rock slides, and effects were felt as far away as Honolulu, Oahu, nearly 150 miles (240 km) from the epicenter. Power outages lasted for several hours to days. Several water mains ruptured. No deaths or life-threatening injuries were reported. On May 4, 2018 there was a 6.9 earthquake in the zone of volcanic activity from Kīlauea. Earthquakes are monitored by the Hawaiian Volcano Observatory run by the USGS. 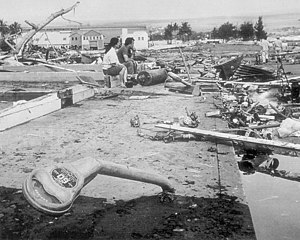 Aftermath of the 1960 Chilean tsunami in Hilo, Hawaiʻi, where the tsunami left 61 people dead and 282 seriously injured. The waves reached 35 feet (11 m) high. The Hawaiian Islands are subject to tsunamis, great waves that strike the shore. Tsunamis are most often caused by earthquakes somewhere in the Pacific. The waves produced by the earthquakes travel at speeds of 400–500 miles per hour (600–800 km/h) and can affect coastal regions thousands of miles (kilometers) away. Tsunamis may also originate from the Hawaiian Islands. Explosive volcanic activity can cause tsunamis. The island of Molokaʻi had a catastrophic collapse or debris avalanche over a million years ago; this underwater landslide likely caused tsunamis. The Hilina Slump on the island of Hawaiʻi is another potential place for a large landslide and resulting tsunami. The city of Hilo on the Big Island has been most affected by tsunamis, where the in-rushing water is accentuated by the shape of Hilo Bay. Coastal cities have tsunami warning sirens. A tsunami resulting from an earthquake in Chile hit the islands on February 27, 2010. It was relatively minor, but local emergency management officials utilized the latest technology and ordered evacuations in preparation for a possible major event. The Governor declared it a "good drill" for the next major event. ^ Rayson, Ann; Bauer, Helen (1997). Hawaii: The Pacific State. Bess Press. p. 26. ISBN 1573060968. ^ James Cook and James King (1784). A Voyage to the Pacific Ocean: Undertaken, by the Command of His Majesty, for Making Discoveries in the Northern Hemisphere, to Determine the Position and Extent of the West Side of North America, Its Distance from Asia, and the Practicability of a Northern Passage to Europe: Performed Under the Direction of Captains Cook, Clerke, and Gore, in His Majesty's Ships the Resolution and Discovery, in the Years 1776, 1777, 1778, 1779, and 1780. 2. Nicol and Cadell, London. p. 222. ^ Clement, Russell. "From Cook to the 1840 Constitution: The Name Change from Sandwich to Hawaiian Islands" (PDF). University of Hawai'i at Manoa Hamilton Library. Retrieved June 17, 2012. ^ "Guide to State and Local Census Geography – Hawaii" (PDF). Washington, DC: U.S. Census Bureau. 2013-09-09. pp. 1–2. Retrieved 2016-09-16. ^ "Hawaii Population 2016 (Demographics, Maps, Graphs)". worldpopulationreview.com. Retrieved 2016-09-12. ^ "Hawaii : Image of the Day". nasa.gov. Retrieved 4 June 2015. ^ "Hawai'i Facts & Figures" (PDF). state web site. State of Hawaii Dept. of Business, Economic Development & Tourism. December 2009. Retrieved 2010-05-23. ^ "Tectonics, geochronology, and origin of the Hawaiian-Emperor Volcanic Chain" (PDF). The Geology of North America, Volume N: The Eastern Pacific Ocean and Hawaii. The Geology Society of America. 1989. Archived from the original (PDF) on 2011-06-11. Retrieved 2011-01-17. ^ McDougall, IAN; Swanson, D. A. (1972). "Potassium-Argon Ages of Lavas from the Hawi and Pololu Volcanic Series, Kohala Volcano, Hawaii". Geological Society of America Bulletin. Geology Society of American Bulletin. 83 (12): 3731–3738. doi: 10.1130/0016-7606(1972)83[3731:PAOLFT]2.0.CO;2. Retrieved 2011-01-17. ^ "Petrography and K-Ar Ages of Dredged Volcanic Rocks from the Western Hawaiian Ridge and the Southern Emperor Seamount Chain". 86 (7). Geology Society of America Bulletin. 1975: 991–998. doi: 10.1130/0016-7606(1975)86. Retrieved 2011-01-17. ^ "Mauna Loa Earth's Largest Volcano". Hawaiian Volcano Observatory web site. USGS. February 2006. Retrieved 2009-12-09. ^ "Hawaii Earthquake History". Earthquake Hazards Program. United States Geological Survey. 1972. Archived from the original on 2009-04-19. Retrieved 2009-12-09. ^ "Top Earthquake States". Earthquake Hazards Program. United States Geological Survey. 2003. Archived from the original on 2009-08-31. Retrieved 2009-12-09. ^ Trusdell, Frank A.; Chadderton, Amy; Hinchliffe, Graham; Hara, Andrew; Patenge, Brent; Weber, Tom (2012-11-15). "Tohoku-Oki Earthquake Tsunami Runup and Inundation Data for Sites Around the Island of Hawai'i" (PDF). USGS. pp. 3–4. Retrieved 2016-10-11. ^ Barnett, Cynthia (August 26, 2016). "Hawaii Is Now Home to an Ocean Reserve Twice the Size of Texas". National Geographic. Retrieved September 2, 2016. ^ "21 sites added to Unesco World Heritage list – Wikinews, the free news source". en.wikinews.org. Retrieved 2017-03-28. ^ Saltzstein, Dan (2010-08-04). "Unesco Adds 21 Sites to World Heritage List". New York Times. Retrieved 2017-03-28. ^ "World Heritage Committee inscribes a total of 21 new sites on UNESCO World Heritage List". whc.unesco.org. 2010-08-02. Retrieved 2017-03-28. ^ Cocke, Sophie (2016-08-25). "Obama expands Papahanaumokuakea marine reserve; plans Oahu trip". Honolulu Star Advertiser. Retrieved 2017-03-28. ^ "Fact Sheet: President Obama to Create the World's Largest Marine Protected Area". whitehouse.gov. 2016-08-26. Retrieved 2017-03-28. ^ Barnett, Cynthia (2016-08-26). "Hawaii Is Now Home to an Ocean Reserve Twice the Size of Texas". NationalGeographic.com. Retrieved 2017-03-28. ^ a b c d e f Lau, Leung-Ku Stephen; Mink, John Francis (2006-10-01). Hydrology of the Hawaiian Islands. pp. 39, 43, 49, 53. ISBN 9780824829483. Morgan, Joseph R. (1996). 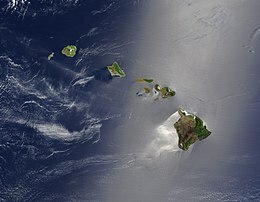 "Hawai'i: A Unique Geography – Volcanic Landforms". Honolulu, HI: Bess Press. ISBN 1-57306-021-6. The Ocean Atlas of Hawai‘i – SOEST at University of Hawaiʻi.